Who and what is an Episcopalian? Robin Williams, an Episcopalian, once described the Episcopal Church as Catholic Lite with ”same rituals, half the guilt.” There is some truth to the statement. The Episcopal Church is a descendant of the Church of England, which was rooted in the Roman Catholic Church. Many of our rituals, traditions, and ways of believing in Christ have come to us through our Catholic roots. In Wisconsin, we like to think of ourselves as Anglo-catholic. The Episcopal Church recognizes the seven sacraments of the Roman Catholic Church and we call our clergy priests, deacons, and bishops. Most Episcopalians are not born that way. Most come from other Christian denominations or from no church background at all. The Episcopal Church has been labeled a ”middle road” or ”via media,” between Roman Catholicism and Protestantism. We bring the reverence and rootedness of an ancient tradition along with a clear devotion to the Bible and the priesthood of all believers. Most Episcopal parishes are vague about membership. We are much less concerned about counting the people who are in, than we are about leaving someone out. That is why all baptized are welcome to communion-it is the Lord’s Table, not the Episcopal Church’s table. If one is baptized in a parish, he or she automatically becomes a member. Membership is transferred from one church to another when there is a move. Another way to become an Episcopalian is to be received into the church when the bishop has his visitation. A rector is the priest in charge of the parish. The term is derived from the Latin for ”rule.” The rector has authority and responsibility for worship and the spiritual opportunities of the church. Who are the laity and what do they do? According to our Book of Common Prayer, the ministry of lay persons is to represent Christ and his Church; to bear witness to him wherever they maybe; and, according to the gifts given them, to carry on Christ’s work of reconciliation in the world; and to take their place in the life, worship, and governance of the Church. We believe in the ministry of all baptized, so all are called to ministry. Some are involved in outreach ministry, some are involved in the worship, some help to keep the building and grounds in good shape. How is your worship different from other churches? Episcopalians are the people of the book – or books. The Bible is our foundation and we have four scripture readings each Sunday and three on Wednesdays. We also use The Book of Common Prayer and The Hymnal 1982. While some people consider written prayers and prescribed liturgy lacking spontaneity, it can also be said that writing things down is a high form of respect and sincerity. Our books show the reverence, foresight, and values we bring to our worship. Can I take communion if I’m not an Episcopalian? All baptized are welcome to take communion. We use bread and the common cup and gather together at the communion rail. Cup your hands in front of you to receive the bread, eat the bread. Take the bottom of the chalice and help the chalice bearer guide the cup to your lips. Once you have received the wine, return to your seat. 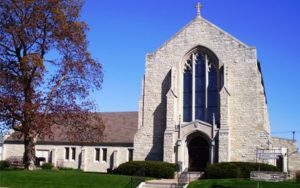 What other denominations are connected to the Episcopal Church? We are in covenant with the Evangelical Lutheran Church in America and the Moravian Church.